Presented here is an obscure 1921 E253 Oxford Confectionary Ruth residing in an eye pleasing SGC 10/1 holder. 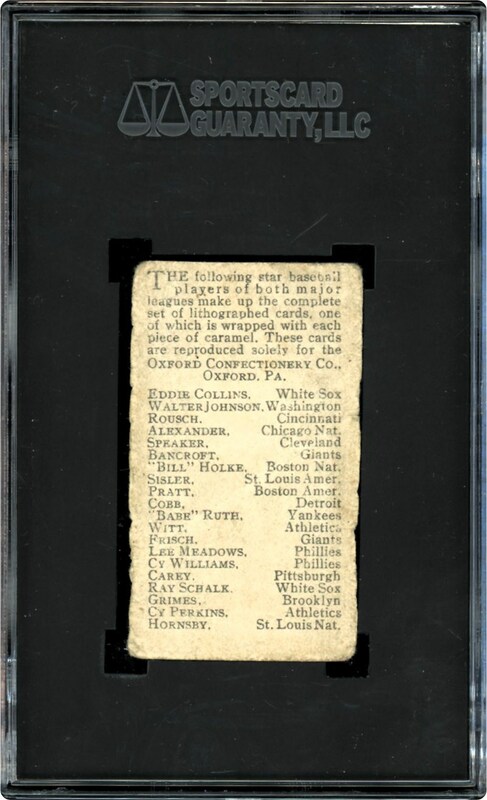 Due to the shortage of Babe Ruth cards from the early 1920's, his 1921 Oxford issue is highly coveted by the collecting community. 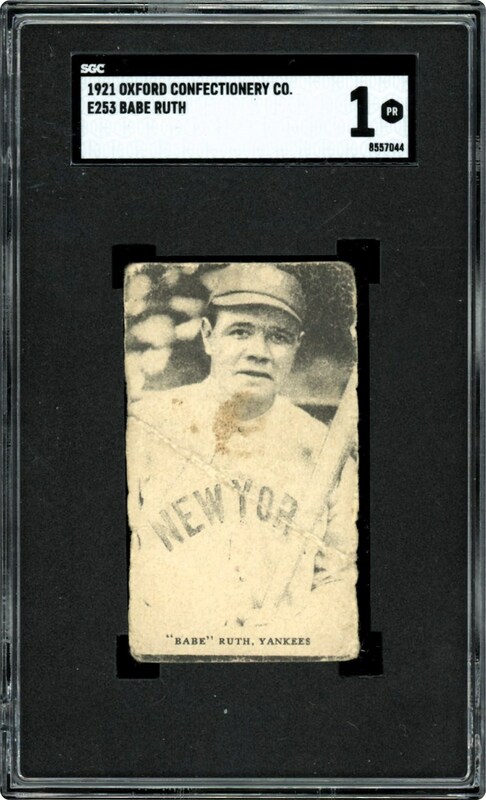 Other than his 1920 "Headin Home" theatre cards, few people realize that Babe Ruth's 1921 Oxford E253 subject stands as his inaugural Yankee card with Ruth donning his new Yankee uniform! Indeed, Ruth's 1920 Felix Mendelsohn and 1921 E121 American Caramel issues both depict the Bambino in his Boston Red Sox uniform with only his various 1920 Headin Home cards revealing Ruth's new Yankee uniform. In 1921, the Oxford, Confectionery Co. of Oxford, Pa. produced a 20-subject caramel set, considered by most experts as one of the most eclectic pre-WWII issues. Synonymous with virtually every 1920's issue, the "cream of the crop" card is Babe Ruth, with the candy company appeasing Ruth's faithful Yankee following by utilizing an image that reveals Ruth's NEW YORK" road jersey. One of the scarcest Babe Ruth issues during his playing days, at the time this was written, SGC had encapsulated only 28 copies. The card itself provides aesthetics arguably outdistancing the technical assessment, with only a modest soiling area beneath Ruth's chin, a diagonal crease running across his "NEW YORK" road jersey and irregular side edging accounting for the grade. More significantly, Ruth's hallowed black & white image portrays fine clarity and contrast, literally transcending us back to the origin of his Yankee playing days. The verso's 20-subject checklist is intact, the final stamp of approval for a card that sits extremely high on many advanced Ruth collectors' want lists, and via the SGC assessment, will not "break the bank!"